If you’ve ever seen Celebrity Juice (and if you haven’t, lucky you), you’ll know how most of the time, the celebrity guests are made to do some pretty humiliating things. As host Keith Lemon continually jumps back and forth over the line between funny and just plain bad television, the host also pushes his guests to undertake some very questionable tasks. Of course, this is late night television, the guests know what they’re in for and the host (I hope) is self aware enough to know exactly what he’s doing, and the ridiculousness of it all. If Bo’ Selecta! was Leigh Francis’ way of mocking celebrities by satirising them, Celebrity Juice is his way of making them humiliate themselves instead. However, last night’s Halloween episode (October 25), seemed to push the celebrity games too far for some viewers. The programme started as you’d expect, with Keith, team captains Holly Willoughby and Fearne Cotton, as well as regular guest Gino D’Acampo, dressed up in various Halloween costumes. Many of the show’s tasks involve blindfolds, with the guests often having to taste various concoctions. However, as Gino knelt down, dressed as Eleven from Stranger Things, and put his mouth over a clear plastic tube, what Keith Lemon had in store was too much for some viewers. 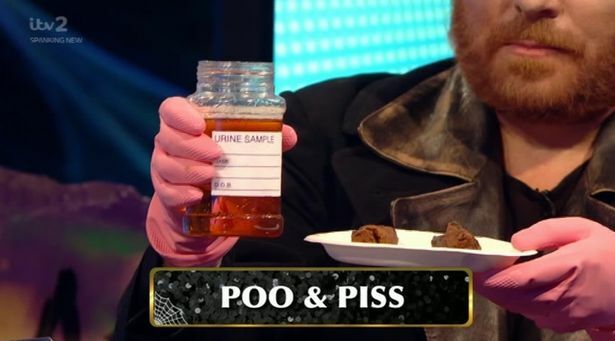 Holding up a plate of ‘poo’ and a jar of ‘p*ss’ to the camera, the garish host proceeded to put the items in the tube and feed them to the TV chef. While fans are used to the show’s outrageous tasks, this one seemed a step too far for a lot of viewers. Said it once, I’ll say it again, if you find celebrity juice funny then there is something serious wrong with you. Seek help! Tuned in to ITV2 to watch Family Guy and the most stupid, disgusting show is on instead. WHY TF ist #CelebrityJuice allowed to be broadcast?! It's not funny AT ALL, it's utterly DISGUSTING and Keith Lemon is a sick 🔔end. Did he really just force 💩 down that Gina guy's throat?! Perhaps unsurprisingly, Gino did manage to correctly guess what he was being fed through the tube. Although Bear Grylls might turn to it in times of desperate need, it should go without saying those two substances shouldn’t really be ingested.